HRH Princess Sirivannavari Nariratana has been keeping the style torch lit for a decade. Starting with her Viva Victorian collection in 2005 for the Bangkok Fashion City project to the grand presentation of her full collection last summer, her love for fashion is clearly here to stay. And the fire continues to burn, with the Princess’s fashion brand Sirivannavari’s Pre-Fall 2014 Collection unveiled recently. Looks from the Spring/ Summer 2014 collection suggest ways to bring these bombastic pieces to everyday life. 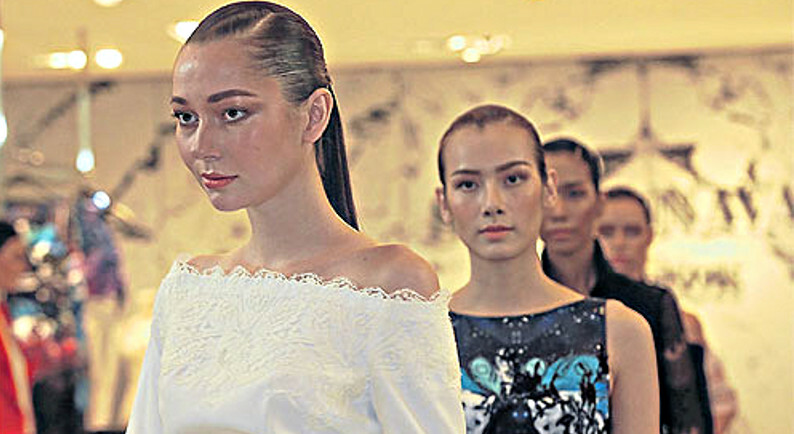 Hosted in front of the Sirivannavari boutique on the first floor of Siam Paragon in a fuss-free atmosphere of short runways and low benches, models zipped up and down four parallel catwalks before posing in front of the store, which was located behind the centre runway. In this collection, lace and sheer chiffon play a key role in many of the pieces. Lace is prominent — as trim on necklines, embellishment on dress hems, mixed and matched with other materials to create pants with a see-through side strip, even as the main star, such as in the pleated tuxedo shirt, which flaunts the entire back and sides under a veil. The high-waist skirts this season capture the trending high side slit, while jackets still exhibit a very voluminous and crisply structured shape. The mid-calf pants, with kangaroo pouch-like pockets, are said to be modified from the Thai jong kraben. With the colour palette sticking to the traditional sombre colours of autumn, expect dark hues like black, midnight blue, burgundy and grey. For a better pop of fun, pair these solid staples with other pieces in the collection that bring back signature prints from the brand’s archive. This includes the trademark X-ray collage from last season, ethnic rock and horses among peacock feathers, for a dash of femininity. The galactic colour scheme and feel still lingers, thanks to these prints and accessories from last season, which create a total look. The brand’s signature X-ray belt and gladiators, made from holographic material to resemble bones and vertebrae, are undoubtedly some of the most recognisable pieces from Sirivannavari that are still in the mode. Indeed, the trick to bringing Sirivannavari from the runway to the streets is to match its signature prints and flashy pieces with something toned down and simple to create a bold yet wearable look. There’s no news of any collection for autumn/winter just yet, but fans of the brand can definitely look forward to more from Sirivannavari for spring/summer 2015.